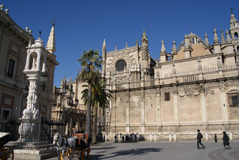 Built in 1756, it is located in the Plaza del Triunfo, and it contains an image of a Madonna, Ntra. Sra. Patrocinio, on a baroque column, in commemoration of the good fortune of Seville during the earthquake of November 1st in 1755, known as the “earthquake of Lisboa", because its epicenter was located near this city and it had almost all destroyed. A huge fire started and minutes after begun a tsunami, which extinguish the flames but destroyed nearly everything that was standing in the lower area of the city.